Our goal for 2018 is to make the Create a Course menu option, formerly known as the DIY menu option, affordable and accessible to all institution subscribers that sign up for custom sites. This means that beginning on January 1, 2018, there will be a one-time set up fee of $750 for the addition of this menu option to your site, and no other Create a Course fee after that. If you can act before January 1, the set-up fee is only $600! If you have two sites, one for your employees and one for your volunteers, the menu option will be added to both sites for the one fee. We think this is the next big step to enable vast training opportunities at all zoo and aquarium facilities. Do you have an Academy site for your employees? The Create a Course menu option can now be permanently added to your site. Do you have an Academy site for your volunteers? The Create a Course menu option can now be permanently added to that site, too. Do you currently have the DIY menu option on your site? Let's bring your annual subscription cost down! We will be reaching out to you to share the details of this great news. We enjoy working with all of you to ensure that the training tools are available for the welfare of the animals, safety training, and great guest experiences, too. We think this is another advancement we can pursue with all of you in 2018. Thank you again for collaborating with us! For more information about our great news, please contact Jon Prange, jprange@sandiegozoo.org or Linda Duca, lduca@cypherworx.com. 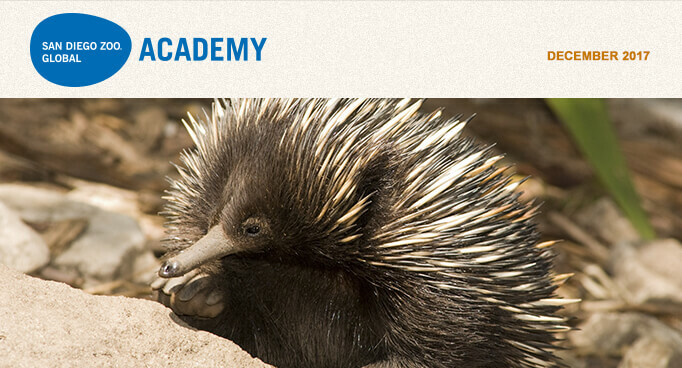 The John Ball Zoo in Michigan is part of the Academy's collaborative learning environment! Please join us for the Administrator's Users Group Webinar, hosted by Academy partner CypherWorx. The next webinar is Wednesday, December 19, at 11 a.m. PDT. Fred Shaffer, manager of staff training and development at the Houston Zoo; and Jon Prange, director of SDZG Academy, are scheduling conference calls in 2018 to discuss training opportunities online, at facilities, and in our industry. The opportunity is to leverage the Academy platform and training opportunities via regular conversations and increased collaboration. Our first conference call will be on Wednesday, January 10 at noon, Pacific time. Please join us if this sounds like it could be of interest to you and your organization. In the spirit of the season, this column is dedicated to presenting several gifts to you and your staff. It is our pleasure that each gift has been made possible as a result of our Academy partnership with you. If you are planning a new exhibit, if your staff needs a great resource for zoological natural history, if you are expecting the arrival of an animal that is new to your facility, or if you simply enjoy learning something new about animals of all kinds, then please open your first gift. It is the gift of time saved. The San Diego Zoo Global Library's animal fact sheets are thoroughly researched, detailed, and continually updated. Each fact sheet includes references and an extensive bibliography. Discover this resource—one that I know that you will want to save and use again and again—here: SDZG Library Guide Fact Sheets. The Animal Welfare Professional course is where animal care professionals learn the basics of animal welfare as a science—including its definition, some of the history of animal welfare law, and the significant differences between animal welfare and animal rights. The Animal Welfare General course was adapted from the two-hour Animal Welfare Professional course. 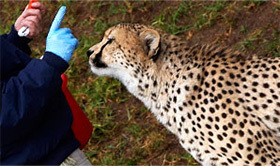 This one-hour course presents general information about four important animal welfare topics and was specifically designed for non-animal care, front-line employees of zoos and aquariums. The Value of a Great Strategic Plan course is a perfect resource if you, or someone you know, will be involved in a strategic planning initiative at work. In this course, you will learn how the strategic planning process works; how to sharpen focus with mission, vision, and values; how to guide future decision making; and how to help drive nonprofit success and achieve maximum mission impact—without sacrificing financial sustainability. Finally—also at the Academy landing page—look for the About button at the top of the page, then scroll down to Academy Newsletter. Currently, there are 57 issues of the Academy Newsletter preserved in this library, available for immediate access. Are you responsible for rolling out the Academy courses to your staff? Are you interested in the legal and ethical aspects of providing good animal welfare? Would you like to learn about how researchers are working to save an endangered species of shark in Australia? You'll find interesting columns written specifically for you by experts in each of these fields. These are gifts for you and all your friends that can be unwrapped by the movement of a mouse and the click of a button. I hope you enjoy these gifts, and I thank you for partnering with the Academy and making them possible. Seasons greetings to you and yours, from your many friends at the San Diego Zoo Global Academy. Each zoological professional and every zoological organization has the means to attain greater good. Available resources and time or other external factors may sometimes seem to constrain personal and professional development, but that is not an obstacle for those committed to their betterment in the service of animals. On any given day, cost- and time-effective opportunities for growth abound. The zoological community is especially good at sharing informational resources and good practices, and this is frequently evident when conscientious caregivers seek guidance on unfamiliar conditions or situations. Other easily accessible tools for advancement present themselves in the form of good news about beneficial breakthroughs, developments, or publications; accounts of unfortunate situations or criticisms that prompt closer self-examination; regularly provided sources like this enewsletter; and intermittent releases of regulatory agency guidance. With little or no funding and limited time, and in the face of the constant barrage of information overload, the flow of life offers ample courses of study. All we need to do is pay attention and focus on what we are seeking: ideas, insights, and practices. One way to proactively manage for not only meeting, but exceeding regulatory compliance with the U.S. Animal Welfare Act (AWA), and to leverage the AWA to enhance animal welfare, is simply reviewing agency information and training materials. Various examples have been provided in this column previously. The latest offering relates to the attending veterinarian and an organization's veterinary care program, and it is an important, informative, and extremely helpful resource. Though it appears, in part, geared toward veterinarians, taking the time to review the online presentation reveals that it should be required for anyone responsible in any way for any element of animal care or use. Here are some of the most interesting attending veterinarian (AV) related lessons to use in evaluating and potentially improving your operations. Full-time on-site AV versus part-time (contracted) AV. A part-time AV is required to prepare and approve a formal written "program of veterinary care" or PVC (see APHIS Form 7002 for additional guidance on required elements) and may need to maintain more extensive documentation than what is otherwise in the facility's/organization's veterinary records. Recordkeeping is especially important with respect to veterinary communications, directions, and examinations/site visits. The AWA regulates licensed facilities/organizations, not the attending veterinarian per se, and any non-compliances relate to the licensee. The AV has considerable authority and broad health oversight responsibilities with respect to all medical aspects of animal care and use. In addition to direct authority over veterinary care, other areas with substantial, collaborative oversight regarding animal health, safety, and welfare include: animal care, generally; cleaning and disinfection; pest control; relevant staff's applicable medical knowledge/training; and after-hours care. The facility/organization must follow the AV's advice, instructions, and recommendations (though the bounds of this obligation may warrant further agency clarification) within the context of the AV's institutional authority. Again, this is a point worthy of further consideration and consultation, as there is shared responsibility between curatorial and veterinary staff when it comes to animal welfare. Availability of appropriate expertise. The agency materials note that "… where the AV does not have training and/or experience with all animals present, the AV must arrange to consult with other veterinarians [and professional animal collection curators and managers] with experience with these species. The AV may also take steps to learn about those species and how to provide appropriate veterinary care." Each individual animal is to be provided veterinary care "that ensures its health and well-being" in addition to programs and measures to achieve "herd health." Daily observation of the physical and behavioral health and well-being of all animals is vitally important. The facility/organization should know when further care is needed—if in doubt, contact the AV. Observations must also be made during emergencies and natural disasters. "Means of communication can include phone calls, log books, or medical records." "It is a best practice for the AV to provide written records/instructions as needed, to be sure these directions are clear and accurate." "It is also a best practice for the regulated facility to record the communications and actions." Records are important. "It is a best practice for the AV and regulated facility to record in writing all activities and treatments for review by the Animal Care Inspector." It is a good idea to note special circumstances, such as ongoing, unique monitoring and treatment of chronic conditions and geriatric or other special-needs animals in the program of veterinary care and/or in individual animal's records. Staff training. "The regulated facility must ensure, based on guidance from the attending veterinarian [and professional animal collection curators and managers], that people working with the animals have the training to carry out assigned aspects of caring for the animals." The facility/organization "must ensure that all training is carried out," including that relating to animal handling, administration of medicines and vaccines, and post-surgical and wound care. The presentation, titled The Role of the Part-time Attending Veterinarian Under the Animal Welfare Act, is a product of the Iowa State University Center for Food Security and Public Health via a cooperative agreement with the U.S. Department of Agriculture Animal and Plant Health Inspection Service Animal Care. As noted in the presentation, for additional information, see the relevant regulations in the Blue Book at 9 C.F.R. § 2.33 (research facilities), § 2.40 (exhibitors), and § 3.110 (marine mammals). See also APHIS Animal Care Policy Manual Policy No. 3, and the Animal Welfare Inspection Guide, Chapter 6, Veterinary Care Requirements for Licensees. The above is the result of reading a single agency email announcement—reviewing the materials with focused attention on high-impact ideas, insights, and practices for promoting (and exceeding) AWA compliance and enhancing animal welfare. A modest investment of time and attention is well worth the effort—and we can do this more regularly as we continue to learn together. Special Note: Join us on Thursday, January 25, 2018 (time to be announced), for Ask Animal Care. Joining us from USDA, APHIS will be Bernadette Juarez, deputy administrator; Elizabeth Goldentyer, DVM, associate deputy administrator of Animal Care; and Robert M. Gibbens, DVM, director of Animal Welfare Operations. Register and submit questions to info@excellencebeyondcompliance.com. ©2017 James F. Gesualdi, P.C. The opinions expressed herein are solely those of the author. This is not, nor should it be construed as, legal advice. In previous newsletters, we have talked about the broad subject of fish welfare. The big question that has been discussed for the past 10 to 15 years is "Do fish feel pain?" If this topic interests you, then I suggest you read an excellent book titled Do Fish Feel Pain? by Victoria Braithwaite. Let's start with some definitions. According to the International Association for the Study of Pain (IASP) (see iasp-pain.org), pain is defined as an unpleasant sensory and emotional experience associated with actual or potential tissue damage. This obviously refers to humans, and the IASP goes on to say that pain is not just a physical sensation. It is influenced by attitudes, beliefs, personality, and social factors, and can affect emotional and mental well-being. There appears to be no specific "pain center" in the brain. The second definition is that of nociception. Nociception, coming from the Latin nocere "to harm or hurt," is the sensory nervous system's response to certain harmful or potentially harmful noxious stimuli. Nerve fibers called nociceptors respond to potentially damaging levels of heat, cold, pressure, or chemicals. Several studies in zebrafish (Danio rerio) shed some light on this discussion. The first study by Gonzalez-Nunez and Rodríguez (2009) conducted according to the guidelines of research ethics as approved by the Ethics Committee at the University of Liverpool, looks at opioid receptors and concludes that "molecular, pharmacological, and biochemical profiles are fundamentally similar to those of their mammalian counterparts, and can therefore be extrapolated to higher vertebrates. Thus, the zebrafish represents a straightforward model to study opioid activity, and can be very useful not only for the analysis of the complex endogenous systems that regulate the action of opioid agents but also for in vivo tests of novel analgesic drugs." The second paper (Steenbergen and Bardine 2014) looks at the use of an opioid (buprenorphine) to block a noxious stimulus (a sudden pH change in the water). Their conclusion was that "the analgesic buprenorphine has similar anti-nociceptive properties in this model as in higher vertebrates and mammals, and is able to prevent the behavioral responses induced by the noxious stimulus. We therefore propose zebrafish larvae as a novel model system in nociception and pain related research." Based on these papers and many others, I am convinced that fish do feel pain, and we need to afford them the welfare consideration of any other vertebrates. I wish all readers of this newsletter a very happy holiday season, and that 2018 brings you much peace and prosperity in your home and work lives. Gonzalez-Nunez V and Rodríguez RE (2009). The Zebrafish: A Model to Study the Endogenous Mechanisms of Pain, Institute for Laboratory Animal Research, Volume 50, Number 4, 373–386. Steenbergen PJ and Bardine N (2014). Antinociceptive effects of buprenorphine in zebrafish larvae: An alternative for rodent models to study pain and nociception? Applied Animal Behaviour Science, Vol 152 pp 92-99.